Dynamic entrepreneurs Erik Ewe and Henry Wong find that there’s no place like home despite having studied and worked overseas. These two longtime friends and travel lovers share a common passion to promote Malaysia’s rich cultural and natural heritage to the world. Knowing that Malaysia has much to offer, they carved out a career for themselves by specializing in the design of customized, sustainable tours that offer tourists a travel experience that they’ll never forget. 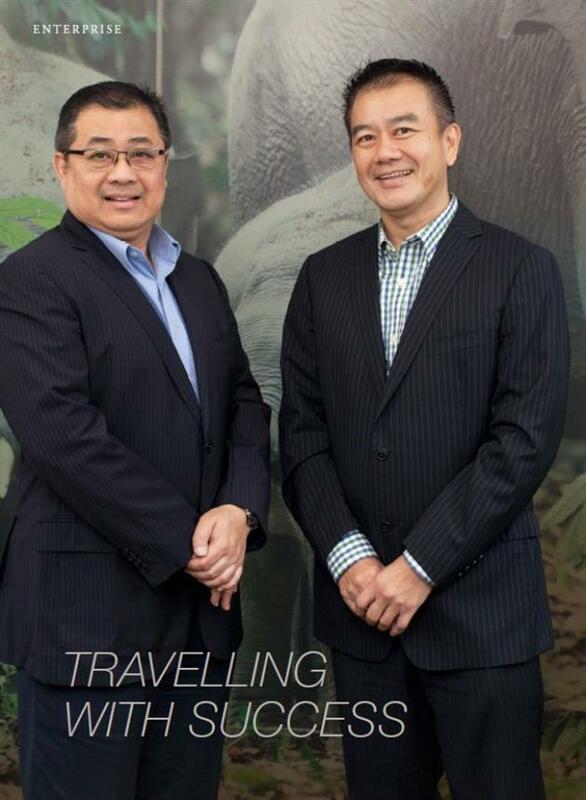 In a recent encounter with Top 10 of Malaysia, Ewe and Wong talk about their backgrounds and the company they started for their travel business -Discovery Overland Holidays (DOH). The décor of the office of Erik Ewe and Henry Wong,managing partners of Discovery Overland Holidays (DOH), say it all. Large photos of elephants and orangutans amidst lush rainforest backgrounds bathed in diffused lighting give a very big hint as to the kind of travel experience tourists can expect with DOH, an enterprise with a 15-year old history. “Malaysia has so much potential as a travel destination. We have majestic, timeless rainforests, mighty rivers, and many other natural wonders that even Malaysians aren’t really aware of,” say Ewe. “And there is the harmonious blend of many cultures too. Nobody can introduce these hidden gems that we have to the world better than we Malaysians can,”Wong adds. Ewe and Wong have been friends long before they became business partners. Ewe, a Penangite, often met Wong, who was from Kulim, Kedah, at high school sports meets. However, after leaving school, these two friends took to separate paths. Wong majored in Geology in Universiti Kebangsaan Malaysia (UKM) and spent 9years working in a British oil and gas company.Ewe studied political science in York University, Canada and worked there for a period of time after graduation. Then he moved on to Peter Stuyvesant Travel, one of the top corporate travel companies in Malaysia in the 90s and was there for several years. As the years went by their common love for travel and a desire to seek out new ventures propelled them to start DOH in 2000. “I had just finished pursuing my MBA at Bath University and was on the lookout for new business ventures when Erik approached me with the idea of starting a travel agency together. As I was someone who had travelled extensively during my university and working years and have enjoyed it very much,I couldn’t refuse his offer!” says Wong. In the company’s early days, the climate for international travel was not conducive. “In our first few years of operation, international calamities like the SARS virus outbreak, the Bali bombings, and the South East Asian tsunami have deterred tourists from traveling to this region,” shares Ewe. “We had to hit the ground with our salesmen to convince people to visit our country. That helped us win the trust of our clients and partners alike. In fact, we still do that and it has enabled us to keep in direct contact with clients and partners,” he adds. Today, DOH has 6 offices in Malaysia, 4 offices in Singapore and Thailand, a fleet of 40 vehicles, more than 150 staff, and more than 1,000 partners worldwide. DOH distinguishes itself from other travel agencies by specializing in customized travel packages for tourists from Europe to Malaysia, which according to Ewe and Wong, is what gives them the niche in the industry. “We tailor make our packages for our niche market clients so that we can offer the unique travel experience that they would desire. I must admit that we are one of the pricier travel operators around, but that is due to our refusal to compromise on the quality of service that we offer for a lower price tag,” says Ewe. DOH’s policy has earned respect and loyalty from its partners in Europe and Malaysia, as well as several awards. One of such awards is the Sabah Tourism Award for Best Inbound Operator, an award rarely won by travel operators based in Peninsular Malaysia, which DOH has wonfor 2012 and 2013. Ewe and Wong’s partnership thrived despite their seemingly opposite personalities. “I am meticulous, organized and generally more concerned with figures and statistics, while Ewe is the go-getter who has an eye for business opportunities and gets things done,” Henry explains. Their management styles proved complementary as the company grew and started other business endeavours. “We acquired Worldspan Travel (M) SdnBhd, a 40-year old outbound ticketing agency, to specialize in travel for Malaysians to exotic destinations abroad such as Bhutan, Morocco, and Tibet. We also opened a café next to our office, The Bad Boss Cafe, six months ago,” Ewe adds. According to Ewe, one of the major challenges in running DOH is still the ‘disturbing’ events that can cause tourists to think twice about travelling to Malaysia. “The recent Malaysia Airlines plane tragedies and ISIS bombings in particular, along with a general perception of political instability that is hyped up by the media, is causing tourists to shun travelling to this region. As such, we have to work very hard to update our clients with the latest news in the country and assure them that Malaysia is still a safe and beautiful country to visit,” he says. In the near future, Ewe and Wong hope to specialize in end products in the travel and hospitality industry, offer more business-to-customer avenues between DOH and its clientele, as well as upgrade their online bookings system and services.